There are a few video slots that have survived the test of time and Reel King is one of them. It is one of those games that you wont always be able to find, but if you do it is worth sitting down to play. 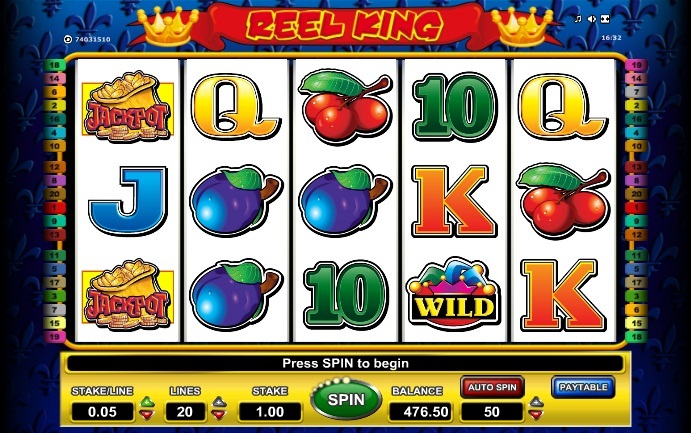 Originally built by the manufacturer Barcrest, Reel King has been recreated as an online slot and has been distributed by Novomatic. It is available at a number of gaming sites, however if you are based in the US then you will not be able to deposit and play for real money due to laws in our country. It's all about the fruit when you see the five reels in this game. The reels are packed with cherries, melons, plums and bells, along with the customary 10-through-Ace card symbols. There are also some stacked Wilds on the reels (helpfully denoted by the 'WILD' sign slapped across them) that can make up some nice winning combinations. In fact, we often hit three or four of these in winning combos. The game's random bonus can arrive at any time and you will know as the game sounds inform you it is about to appear. 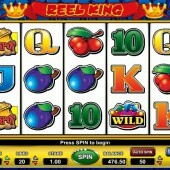 The Reel King figure pops up on one or more reels and starts playing his own slot machine. If he keeps pulling combinations of 7s then you will keep winning. This can continue for a while, especially if there are more than one Reel King in view. If you like Reel King then you will likely enjoy the Rainbow Riches video slot, which has been popular in casinos for a while. Novomatic have even released a mash-up of the two games called Rainbow King. This game ties bits from both games together to make a very entertaining slot.